I have been to a conference in Bristol. It was called the Community Partner Summit and aimed to continue to build a Community Partner Network - a network between universities and those working in the community. I thought it would be useful so I elected to go. All expenses were paid, so I had nothing to lose but my time. When I got there I wondered whether I had made the right decision as nothing appeared familiar and there were a lot of important and influential people there who seemed to know each other. I felt like a small fish in a big pond. It is ten years since I have been to a residential conference and all the old prejudices were coming to the fore. I am not a natural networker, so why am I here? Hope I don’t fall asleep. I expect they will play a lot of silly games. I sat to one side of the room and when the conference started I found it very difficult to hear what was going on so that made me even more frustrated. Apparently the keynote speaker was brilliant and inspirational but that passed me by because I didn't catch a lot of what she was saying and by then her lovely Harlem accent was making me sleepy and I was drifting off…. She appeared to be talking about problems she was having relating to academia. What was the problem? We don’t have any have any trouble with our partners at the University of Hertfordshire (UH). I couldn't relate to it at all. Was I missing something? After a tea break, it did get a lot better as we were told to make contact with other delegates and share our stories. I discovered there were other HLF All Our Stories grantees with very interesting projects and who felt a bit lost too and some other delegates were voicing my concerns too. I was not alone! I always find that the best bit about any conference is talking to other delegates and this was no exception. The following day was much better and I began to sift through the jargon to understand what the conference was about: building a better working relationship between those working on community projects with academics in universities. In a nutshell, persuading academics in universities to share their research with those working for and with the community on the ground, and vice versa. Both sides would benefit working in a partnership. Apparently this is a big issue nationally and internationally. Even when the penny dropped, I found it difficult to relate to this and then I became suspicious and began to question our relationship with UH. Sopwell Memories is in partnership with UH. We are a therefore a community partner. Was there something they haven’t told us? Should we be asking more of them? Are they being really nice to us just because we helped them get their research grant? At the end of their grant money, will they drop us like a hot potato? Are they feeding off our passion? You see, I am re-learning the jargon! I still believe we have a good working relationship with Sarah, Julie and Paul at UH. Talking of which, we had a meeting of the team at UH last week where we held an overview workshop to discuss progress. It was really good and left me feeling re-energised and full of enthusiasm. Sarah Lloyd from UH had us outlining our Sopwell Memories highlights and challenges and it was amazing what came out. She also identified gaps which could be filled. The outcome is that there is to be another workshop where we all get round the table to decide which extracts to use on the website. There is a lot of work to do. Was the conference worthwhile? I think so. It has taken me out of my comfort zone and made me question my role in the higher scheme of things. Will I attend another conference? I think I need to get a hearing aid first! So where exactly is Sopwell? One of the aims of the project is to get people to appreciate the Sopwell area of St Albans. So as well as collecting memories from residents and ex-residents, we will be producing leaflets describing walks around the area, with the aim of introducing visitors to the many wonderful green spaces and to learn about its history. The Sopwell Residents Association has been holding history walks for several years now and they are always popular. So I thought this would be an easy task as I quickly put together five easy walks. But then it was pointed out to me that what I think is an easy route to follow may not be to a stranger to St Albans, let alone Sopwell. When it is all so familiar, it is difficult to write a route with the eyes of a stranger in mind. Another niggle is that some people who live in St Albans are not familiar with and do not know where Sopwell is. They have heard of the Sopwell House Hotel and think that is where Sopwell is. (One of my original interviewees still tells me off for not putting ‘St Albans’ as well as Sopwell on the cover of my book). Hopefully, these walk leaflets and the book, and eventually the website containing Sopwell memories will hopefully go some way towards educating residents and visitors about Sopwell. Interestingly, most Albanians have heard of Cottonmill, which is just one part of Sopwell, maybe because they used to live there or they have seen it on the S4 and S5 buses, or from its reputation as being a bit of a rough area. Having interviewed many residents and ex-residents, I wondered why it had this reputation. Admittedly, children in the 1940s, 1950s and 1960s were allowed free rein to roam around at will. I have heard many stories where during the school summer holidays, parents kicked them out in the morning and they weren’t expected back until evening meal time. They had a wonderful time roaming all over the green spaces, building sites, railways and the river. They got up to all sorts of innocent mischief. On the other hand, there were many reported stories of vandalism on the newly built estates and I think this reputation has been hard to shift. The anti-social behaviour was not because of a lack of community cohesion as, having interviewed many residents, I found that community spirit was strong. Everybody knew their neighbours and looked out for each other. There is still a lot of that around today. Perhaps the rough reputation has finally disappeared with the growing up and moving on of the young people. So where exactly is Sopwell? 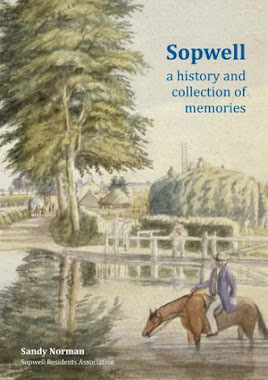 I quote from my book "Sopwell: a history and collection of memories": Sopwell is bordered by Old London Road, Holywell Hill (from Belmont Hill southwards), St Stephens Hill and Watling Street down to the Park Street roundabout, the North Orbital as far as the mainline railway bridge and encompasses the Cottonmill and St Julian’s estates, the area to the east of St Stephen’s church, New Barnes, Priory Park, the Verulam golf course and the Riverside Road Fisheries. So now you know. Now to get back to my walks…..